Our latest development, WebSCR, is designed to do just that. 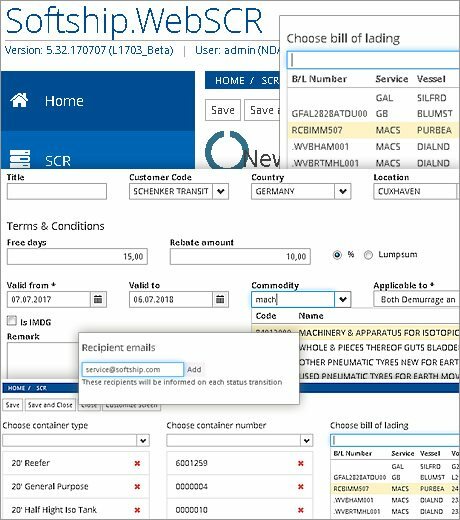 Softship's brand-new web-based Service Contract Request module WebSCR has been designed to make it as easy as possible for agents and principals to negotiate demurrage and detention service contracts. The new platform – accessed via a webpage from a desktop or while on the move using a mobile or tablet – removes deliberation and simplifies the entire Service Contract Request process, to save both carriers and agents time and money. As a module of the Softship LIMA carrier suite, both principals and agents use the WebSCR. The agent logs on to the system through their internet browser and makes a request/tenders for a service. The carrier can then use the same WebSCR system to accept, negotiate or reject the offer. For carriers, the WebSCR tool also directly feeds the contract data into Softship’s equipment management system as part of the Softship LIMA workflow processes. It’s really that simple. Log in – make or check requests – settle a deal – deliver the service. The company is headquartered in Hamburg, Germany, and has been listed on the Frankfurt Stock Exchange since 2001 (ISIN: DE0005758304). It also operates offices in the Philippines, Singapore and USA.